UPDATE: If you want to start a blog but aren’t sure where to start then I'd love to tell you about a simple and easy resource that worked for me. Bonus points because it’s actually FREE right now. Get the First 10 Steps of a Profitable Blog that walks you through the 10 steps you MUST get right in start and building your blog here. I love Pinterest. This website that lets you create virtual boards of everything you love on the Internet was pretty much made for this girl that used to keep scrapbooks of magazine articles and layouts. To this day, I feel sorry for anyone that had to have a party, wedding, or baby before Pinterest existed. 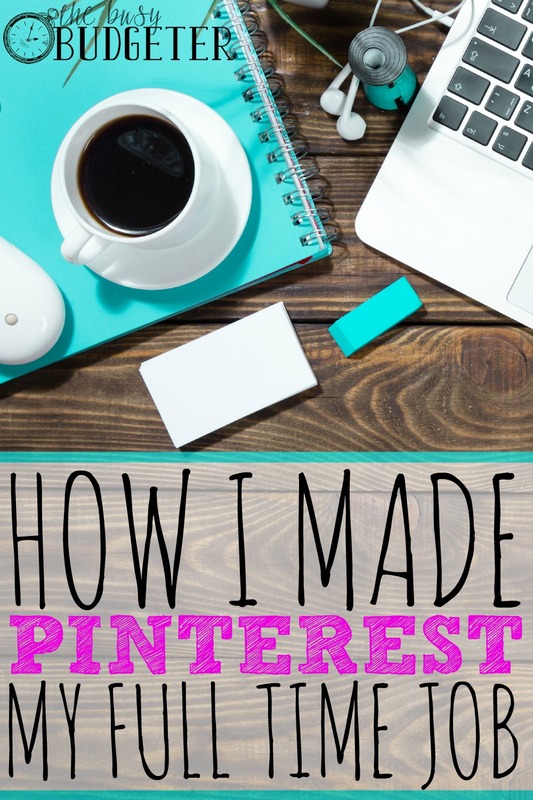 I wanted to work for Pinterest and just pin things all day. That would be my dream job. Unfortunately, while there are many Pinterest jobs out there, “Pinning specialist” isn't one. I jumped on the Pinterest bandwagon shortly after it was launched. As my pinning years went by… I completely transformed our financial life. I reduced our spending by over $23,000, quit my job to stay home, then started a home day care to make $3,000/month while I stayed home with my kids. I learned how to use Pinterest to support my goals of saving money. Having a visual display of my dreams and aspirations (like my dream home board or my travel board) that I checked into daily was incredibly motivating. Having a constant stream of money saving tips and tricks from experts that have navigated these waters before (Like my Frugal board) kept my goals constantly in the forefront of my mind. At some point, I realized that all of those experts on Pinterest are bloggers. A blogger is a person that starts their own website and publishes content to it. All of those pins I loved were from someone like me researching an article or writing from experience and publishing it, then putting it on Pinterest. Some bloggers are huge with millions of followers and websites that cost more to run than a traditional magazine. Some are small and run their sites as a hobby or a side job. I started a blog. I began creating content for problems that I couldn't find answers to. Things like 3 weeks of cheap and easy dinners in under 15 minutes and The Ultimate Money Saving Workbook. Starting a blog is crazy cheap and I was making about $70/month through Adsense ads so I thought I had hit the big time. I had no idea the income potential of a blog. Thanks to bloggers like Becky Mansfield of Your Modern Family who publish their blog income reports, I realized that my $70/month income was just the tip of the iceberg. I got serious and turned my blog into a business, joining The Elite Blog Academy, and relaunching into a new website, The Busy Budgeter. I started spending 10 hours a week blogging, then 20 hours a week. My income rose sharply as the hours that I dedicated to blogging did. Last month, I made a full time income from my blog exactly one year from starting this blog. Truthfully though, money isn't the best part. The best part is getting to help people change their financial outlook without charging them a dime and getting to work every day on something I'm passionate about. Pinterest sends me most of my blog traffic and my income is tied tightly to the amount of blog traffic I get (much of my income is from ads on my blog). It's safe to say that I made that income almost entirely through Pinterest. A good part of my job is to repin Pinterest pins that I love so that my followers (you can join me here) get the best of the best in their Pinterest feeds. Trying out new ideas I see on Pinterest to share them with others is also part of my work. I can officially say that I've turned my love of Pinterest into a full-time job. It's not just me, though… Lots of people have done the same! I've had a pretty amazing career prior to blogging and without a doubt blogging is the best job that I've ever had. If you have the urge to write, an expertise in something that people need help in and you absolutely love Pinterest, then blogging may be the perfect fit for you. You can go through my *FREE* Step-by-Step guide of how to start a blog by clicking here. (Bonus points because it's written for someone who isn't great with computers and technology). The absolute best resource in the world though is The Elite Blog Academy. I credit my success to it entirely. You can find out more about it here, but it's only open to new members once a year. Your best bet if you want to join is to join the waiting list here so they email you updates. 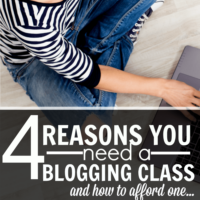 Keep in mind, Elite Blog Academy is expensive, and it helps to have a foundation in blogging before you take it so don't wait to start blogging until it's open. You can get started for about $3.49/month. If you want to start a blog but have no money to put into it, then the best free resource is a guide called First 10 Steps to a Profitable Blog. Study it. Highlight it. Make it your new best friend. Just 27 months after starting the new blog, this blog supports my whole family. So, you should totally start a blog! Great information! I have considered blogging but am not sure what I want to write about. Some of the sources you listed may help narrow it down. Thanks! I have been blogging since 2005, but only recently started to turn to monetizing it in March 2015. So far, though, I haven’t taken it seriously enough, and as such, I haven’t made a lot. I’m in process (thanks to Pinterest inspiration! Ha!) of getting into more of a “business” groove with my blog. As an experienced blogger, I was genuinely interested to read your post. It took me a long time to realise that my target market readership (women who want to travel first class on a budget, or who want to enjoy first class experiences regardless of budget) were actually on Pinterest. It’s an incredibly powerful tool to drive traffic if it is where your likely readership is, and you connect with them in a creative way. Just uploading a whole load of links and expecting the magic to happen won’t work. 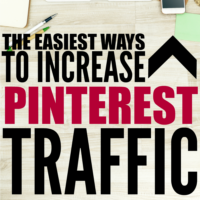 You need a whole Pinterest strategy – but once you get it right, it’s great! I’m very knowledgeable in and like to share many different categories. Hair, money, health, crafts, etc. I’ve blogged years ago and am having issues figuring out how to put all of these different categories. Any advice? Focus on just one or two (if they relate to each other). Good focus and knowing your audience are the key to success. Thanks for the great inspiration that I can make a living blogging, pinning, and doing what I love. I’ve been up and running for just under a month now and I will certainly be checking out these resources! Thanks for the inspiration and guidance. ? I found your site also from pinterest, and read your post on how you turned pinterest and blogging into your full time job. I started my blog back in July however I am still struggling with getting it set up the way I want, posting schedule and such but I am still plugging away at though. Thank you for your inspiring post and blogging tips. Same. I’ve been traveling for a few years and have always love writing, so I recently jumped on the Travel blog bandwagon but find myself quickly feeling discouraged by the technical aspects, the marketing, the “strategy” of it all–and especially everyone saying to “have a niche”. I don’t feel like I’m just one thing…Labels and categories didn’t suit me in school, they don’t suit me in “blogging”. I just want to be my self and share my experience. Natasha, then i would just say, YOU are your niche! Wherever you are travelling, you see it through your own eyes in your own way. That is what you will write about. People who enjoy what you do, or are interested in the places you go, will want to read your thoughts. I am just thinking about a great blog I was excited to find, about a town in germany where some of my great-grandparents came from. The writer went there because she is interested in wine, and it is a wine region. She wrote about people she met, history, grapes… It was the best write-up I found for my family history project!! So, I would say, be curious, be friendly, tell everyone what you discover, and have so much fun! I agree with Renata you are your niche. Write down categories that you are passionate about and then write about each one of those topics and see where that leads you. I know the technical stuff can be hard but you can always ask question. Join a facebook group for blogging. There is always someone who has the answer. Best of luck with blogging. I LOVE the comment that YOU are your niche! I too have some of the same craziness in trying to fete in a niche due to varying experiences from life that so many could relate with. My passion for helping military moms, to helping people make a great income in network marketing to nutrition. I just realized I could use my name in a domain and have varying topics! Just needing to get started. 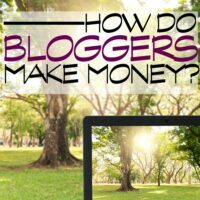 Still confused how an income is made with blogging, but can’t wait to find out (definitely NOT an area of my expertise)! Thanks so much for all the good information and inspiration on your blog. I have learned so much from you and others. I finally took the leap and started my own blog so I am a total newbie. I keep returning to your site so I can see where I need improvement! Thank you for helping to motivate and teach me. I’ve been thinking about this same thing. I blogged years ago and just got busy with life and kids and lost interest. Where I’m stuck is that I have so many different categories and don’t want to start with more than one blog and am at a loss as to what to use on my blog. Do I stick to $$ or crafts or hair or health or find a way to fit all of my content together? Any tips on where to start with all this content ? Mostly it’s pageviews Elizabeth… I worked really hard on building traffic up until I got to 100,000 and then switched to monetizing the traffic I had. My best advice for blogging is always to invest ina good blogging class. My favorite is Elite Blog Academy. Hi Tara. I only have experience researching the blogging business, and I have never actually started a blog. That said, focus on your brand name and target market first. For a site like yours, start writing in one or two categories only, and name your blog something more general (not tarashairtips, something else that encompasses all of your category ideas).. once you have this, focus on those categories until you have some readers. Then begin adding 1 or 2 posts from a new category you want to introduce. For example, you could start with hair, and then move toward health. Or you could start with crafts and move toward money. Or start with hair and move toward crafts. It’s really up to you, how you go through things. Look at some other blogs with multiple categories for inspiration. I found your article very interesting and informative. Please can you write about how to use ad sense for generating extra money from blogging. Thanks. Shweta, Ad networks (like adsense) are easy in tha it’s passive income. Ad revenue relies on pageviews for you to get paid. The more pageviews, the more you get paid. I love this post. My blog is just over a year old. It started out as a platform to share my knowledge to raise awareness for my business. In 2016 I am focusing on monetizing the blog, posting at least 3 times weekly sharing business tips. My aim this year is for my blog to generate enough income for me to live comfortably on. I realized how important Pinterest was towards the end of 2015 when I saw that most of my social media traffic was coming from Pinterest. It’s well and truly now my nuber one focus. Thanks for sharing this post. It really inspires me. It’s a great thing to see that just by increasing the hours you dedicate to blogging (and I mean seriously creating new content that others like) can, and do, actually help not only increase the amount of pages indexed, ranked, linked to and read by visitors. But it also helps a blogger learn more about their site and readers (through analytics) apart from an increased income. Thanks for the information! I’m just starting my blogging adventure at mommysnotperfect.com and will definitely be looking at your posts and links for resources! Thanks so much for the advice. I’m brand new to blogging (only 2 posts in the 5 days since I’ve launched) so I’m just getting my feet wet. I’m interested in monetizing my blog but know I need to work on building the traffic first. I’ve just started a Pinterest for my blog as I’ve read elsewhere that the readership from Pinterest not only drives traffic but has staying power. I realize that the more a person pins on Pinterest the more their name gets seen. So my question is do I just pin to my blog account as I would my actual account in order pull that similar audience into following me? I would blog about everything! I love to bake, sew, make craft projects, gift ideas, encouragement, helping others, life, travel, kids, home projects, house cleaning, planting, and everything in between. So why not write about things I already do? Thanks to your posts and encouragement I decided to start my own blog. I’m hoping to eventually get to the point where I get paid for my work. For now, it is just for fun. Thank you for your posts and encouragement. I found you on Pinterest!!! I just purchased a domain name, in hope of getting a blog up and running. As far as Pinterest do you continue pinning to your personal boards or just pin from your blog to bring in readers? Hope that makes sense! I would blog about raising 4 children as a single parent, I have lots of experience! Interesting… Pinterest sounds encouraging, though I still haven’t gotten the hang of it yet. What should you do to get more followers and all that? Just like and pin other people’s posts? This is really great information. I have lots of ideas what I would blog about. Like fitness and beauty. Blogging is something I would definitely consider doing. I just don’t know how I would get started and what I would need! If you could give me some steps it would really help me out thanks! I’ve already started blogging but this was a good read to keep my motivation up 🙂 it’s really hard some days because it really does take a lot of time and effort but I can see progress being made even in the 3 months since I’ve started! Thank you for sharing. I am just now getting to the point of learning about pinterest. Life is all about one step at a time. Great post lots of good info here! Thanks for linking up to Merry Monday! Sharing on my Blog Tips Board! Have a great week! I would love to get paid to do nothing but pin all day too. LOL! 🙂 I love glancing through all the different posts and ideas. Facebook used to be my procrastination tool of choice, but now I’m a Pincrastinator convert. I just signed up for the quick blog growth guide. I could use some quick growth! Thanks for sharing this. I do have a question. I have been looking up blogging for a while and have came across taxed. How do you do your taxes for your blog? You inspire me! I have retired from a 23yr career and am only 50, I want to blog! It seems so interesting and creative. Thank you! 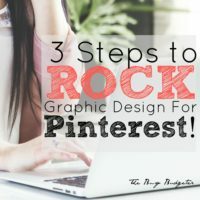 Great advice, I have rapidly become pintrest obsessed since getting on it -less than a month ago! I will take all this into consideration for sure. As a stay at home mom the thought of making money off something I just adore would be a wonderful bonus! I considered blogging but know very little about it. Not quite sure what to write about. I thought possibly writing about education and the demands it has on teachers and how to balance one’s life with those demands since I am a special education teacher and struggle with the demands daily. I also battled endometriosis and would love to share my experiences with that and the ongoing medical issues associated with it. A huge plus is that I am an avid dog lover but that just seems too cliche to write about since many individuals writes about their love for their puppies. Any suggestions would help. Thank you. I would love to blog but I too am not sure what I would blog about. I have had a lot of interesting life experiences and really do have good advice but I’m not a licensed counselor. I used to be a battered wife and escaped a bad marriage. I also have the experience of surviving a car collision that changed our lives and have a TBI and I also have autoimmune disease and raised a child with Lupus and Juvenile Arthritis. I am a classically trained vocalist and have sung in various operas…I homeschool and I raised 7 children in a blended family. I am bilingual…what could I blog about with such a wide selection of topics. I’m restoring a Victorian home built in the late 1800s. Like I said…I’ve had a lot of life experience and I’ve overcome a lot and absolutely love my life now and am incredibly blessed and I think I would like to bless others too but just don’t know how to go about doing it. I was thinking perhaps a blog would be one way. Any thoughts or advice? Please forgive my clueless…ness… Do you write blogs on Pinterest OR do you use Pinterest to pin blogs from other websites? I am not a blogger. Actually, I don’t want to write something. Is it any way to get money on Pinterest? Please tell me… Anyway, your blog is lovely! Great post, and I love your site! I am a new blogger (2 months), and I am really wanting to start utilizing Pinterest. I have been trying to join various group boards, but I have not been getting any response. I have tried various methods – going to the founders website and emailing them directly, commenting on pins and asking to join, commenting on ‘Add Me’ boards, etc. Is there a specific way to go about getting invited to group boards? All of the info that I pull up on Google is a couple of years old. Thanks so much! I love reading stuff like this. I really need to start using Pinterest again for sure, so many great ideas on there. Congrats to you and your progress this has inspired me to work harder on my goals.